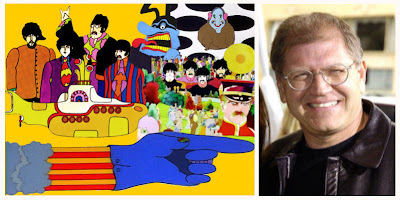 The original 1968 animated film followed Old Fred who is sent by the Mayor's of Pepperland for help in a yellow submarine after music hating Blue Meanies seal the Sgt. Pepper's Lonely Hearts Club Band is a music-proof bubble and turn all of the citizens of Pepperland into statues. Old Fred travels to Liverpool and tries to persuade Ringo and the rest of The Beatles to travel back to Pepperland and restore the music loving paradise under the sea. The Beatles themselves only appear in a live-action cameo at the end of the original and their animated characters were voiced by other actors. The silver lining to this story lies in The Beatles music itself. Disney who has yet to comment on the acquisition may have a hard time nailing down the rights to the music of The Beatles. Disney is reported to have an "army" of lawyers trying to get rights to all 16 tracks in order to make "Yellow Submarine" for a 2012 release. The release is pitched to coincide with the 2012 Summer Olympics in London. Some of the bigger songs include: "Yellow Submarine," "Hey Bulldog," "Eleanor Rigby," "Lucy in the Sky with Diamonds," "Sgt. Pepper's Lonely Hearts Club Band," "With a Little Help from My Friends," "Baby You're a Rich Man" and "All You Need Is Love."